Taoiseach Leo Varadkar has sought an independent report on the National Broadband Plan to determine if it has been compromised after details of further private dinners between Denis Naughten and the broadband bidder were revealed. Mr Naughten resigned as Minister for Communications, Climate Action and the Environment earlier today in the wake of the controversy. In the Dáil this afternoon Mr Varadkar outlined interactions between Mr Naughten and David McCourt, the US businessman involved in the tender for the broadband plan. Mr Varadkar said he was informed late last night by Mr Naughten of a private dinner he had attended at Mr McCourt's home in 2017. This dinner was organised by Minister for State Pat Breen, who was also at the dinner. This morning, Mr Naughten told Mr Varadkar that he had had at least three further private dinners with Mr McCourt. No officials were present and no minutes of the meetings were taken. Mr Varadkar also informed the Dáil that he had met Mr McCourt last March in the US at a public event but the broadband plan was not discussed. The Taoiseach has said that Richard Bruton is to take on the portfolio of Communications, Climate Action and Environment on a temporary basis. Mr Naughten made a short statement in the Dáil this afternoon before he left the chamber. He told the Dáil that having met the Taoiseach last night, it was clear from the meeting that Mr Varadkar did not have confidence in him. He said that during the meeting, he offered to hand over the National Broadband Plan to Minister of State Sean Kyne. However, he said the Taoiseach refused that offer and asked him to consider his position. He told the Dáil: "For my family, constituents and 1.1 million people waiting for this essential [broadband] service, to ordinary people in rural Ireland, I've given the Taoiseach my resignation." "If I was a cynic, which I am not, I believe the outcome is more about opinion polls than telecom poles. It is more about optics than fibre optics. "The fact is that as Minister I have to meet investors, whether it is in the telecoms or energy or any other sector. These are the people who provide jobs in this country. "That is the context in which I had meetings with Mr McCourt and that is how it should be seen." Mr Naughten said he was "absolutely satisfied" that there was no interference in the procurement process by him. Ceann Comhairle Seán Ó Fearghaíl paid tribute to Mr Naughten after the resignation. He said: "I think it can be said on behalf of all members that this is a sad occasion and all of us who have known Denis Naughten have known him to be a man who was decent, committed and a man of integrity and whatever policy differences people might have, I don't think anybody could challenge that situation." The Independent Alliance has said it supports Deputy Naughten's decision to resign. 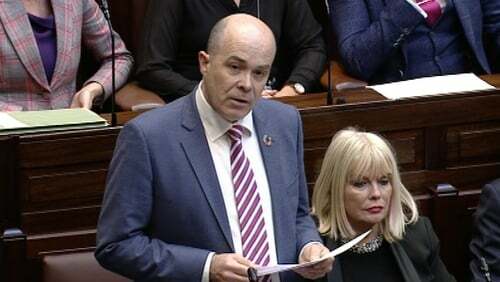 In a statement, the grouping said: "We would like to express our appreciation for all the good work Deputy Naughten has done as minister and we wish him well in the future." Yesterday, it emerged that Mr Naughten paid for lunch for Mr McCourt in Leinster House last April. Mr Naughten confirmed yesterday that he booked Mr McCourt and his family into the Leinster House restaurant to have a celebration. Mr Naughten did not attend the lunch at the time. He also said that he met Mr McCourt on one other occasion, as part of a meeting attended by the Secretary General and Assistant Secretary of the Department of Communications on 26 June. Last week, minutes of a dinner meeting in New York showed that a ten-minute discussion took place between Mr Naughten, Department of Communications officials and Mr McCourt. Mr McCourt did not address his remarks to the minister, but to a department official, official records show. Mr Naughten was accompanied to the dinner by his political adviser and three officials from his department. Following Mr Naughten's resignation in the Dáil, Labour Leader Brendan Howlin suggested that the debate be adjourned as Mr Naughten had left the chamber. A spokesperson for the Granahan-McCourt led consortium said it had no comment to make about today's developments. Speaking on RTÉ's Six One News, Mr Naughten said he told the Taoiseach last night about four dinners he had with Mr McCourt. Earlier, the Taoiseach told the Dáil that Mr Naughten had just informed him about one dinner with Mr McCourt last night, and about a further three dinners at their meeting this morning. He said that it was not justifiable for him as minister not to engage with some of the biggest companies here and internationally to bring a broadband network to Ireland. Mr Naughten said he would deal with the issue of supporting the government on a case-by-case basis. Minister for State Pat Breen has said that he has no role in the National Broadband Plan, following the statement by Mr Varadkar in the Dáil today. Mr Breen said he has met Mr McCourt three times in his role as Minister of State. He added that Mr McCourt's home is close to his own home in Co Clare and he was gotten to know him on a personal basis. In a statement, Mr Breen said he has visited Mr McCourt's home several times and has also met him on other occasions in a private capacity. He said he arranged the dinner meeting last year at the request of Mr McCourt. Mr Breen added that to his knowledge the NBP was not discussed at the dinner.